The demon of stupor makes place for the demon of irritability, contempt, acute petulance, a love of quarrels. 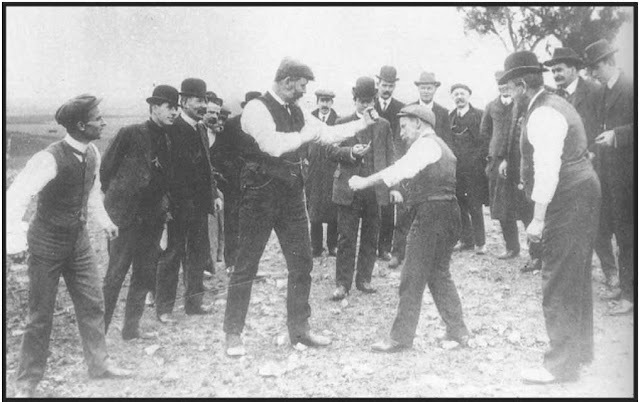 A penchant for outbursts of rage, nasty verbal exchanges and even…yes… fisticuffs. Clearly what happens on the mountain is a reflection of worser things taking place in the flatlands. But it is the infection of the atmosphere that worries us most. The unthinkable happens. A fierce discussion between Naphta and Settembrini, just like the ones we witnessed so many times before, turns awry. Naphta challenges Settembrini for a duel. Settembrini accepts. The discussions are over, it is the defeat of the intellect. Hans, Wehsal and Ferge try to bring the two antagonists to reason but with no success. Mann has read his Lermontov and the proceedings of the duel are described in detail. The duelists go for quality; they choose Belgian Brownings to settle their discord. Standing face to face, both Settembrini and Naphta underscore their intellectual stances. Settembrini the humanist, refuses to shoot at Naphta and makes his point by emptying his weapon by shooting in the air. Naphta is furious, turns the pistol and shoots himself. For him too, the suicide, the self-destruction underscores the intellectual stance he has been defending since we met him for the first time. It is just brilliant how Mann brings this scene, so well in line with what those two man have said before and what we have come to expect from them. Can’t believe it, but tomorrow we will read the last chapter.